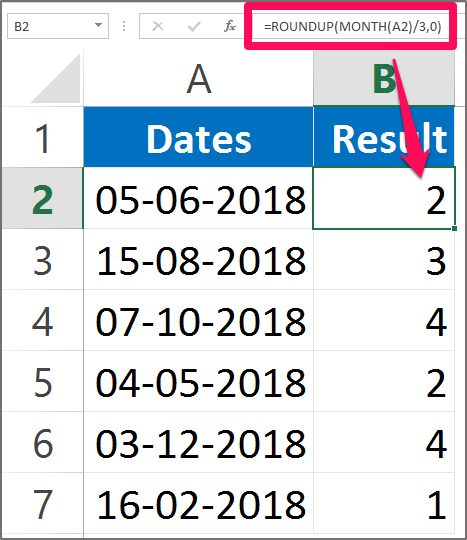 In Excel has various in-built functions that returns years, Month number, and name of the Month, Week number, Weekday or any other days. But there is no built-in function that can calculate and return the Quarter Number. Quarters are difficult to find because it depends on the year ending date. Quarter formula in Excel. Usually Calendar year is taken into consideration while calculating the Quarters for the year. Calendar date ends on 31st December. A year is divided into four quarters. 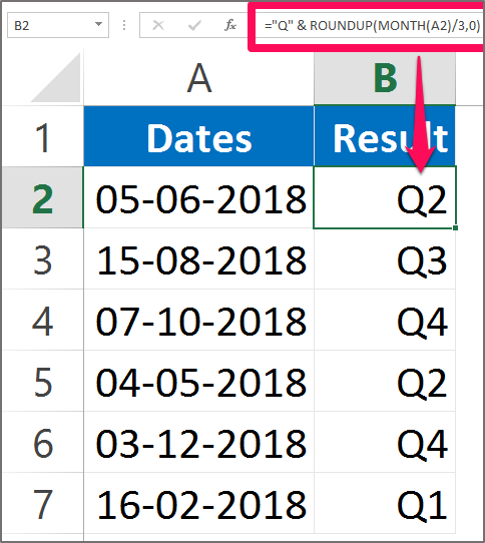 This tutorial will explain you how to find the quarter from the dates given. You need to use Roundup function along with the Month function to calculate the Quarter. The Roundup Function in this formula rounds a number to the nearest whole number. The Roundup function will always round number 1-9 upwards. The Month function in this formula returns the number of the month. You can enter the Month function by using quotation or by using cell reference. Why is 3 in the formula? 3 months is in the formula because a quarter has 3 months and we have to divide the year by 3 to get quarter answer. Instead of getting 1 in the result column it will now appear as Q1. We can read it as Quarter 1 instead of just 1 though it is understood, but still to be more specific and clear. We can now read the data as the date 05/06/2018 stands in the 2nd quarter of the Year. This function is used when we have to do certain analysis based on the quarter and also while comparing data based on the quarters. Hope you like our tutorial on Roundup function & Month function for more cool and amazing trick of excel Like our Excel Superstar Facebook Page and subscribe to our Excel Superstar YouTube channel. Excel Superstar is the leading online training company, which provides Online Excel Course in Hindi. Connect with us and become an Excel Superstar.